Buying sunglasses, or indeed any glasses, can be tricky. There is so much to think about – the shape, the frame colour, the lens tint, the nose bridge, the material etc. etc . So here’s a video and a quick reference guide to help you make the right decision – you may be spending a significant sum of money on them after all! Choose styles that you love! Your style personality is so important. You want your glasses to be a reflection of you, not something that looks completely out of plhttps://youtu.be/kdUw70t5mfUace or that you wear but feel self conscious of. So if you like a more feminine style, choose glasses that are also more feminine in design (like the Lipsy or pink Ralph Lauren ones pictured below perhaps). 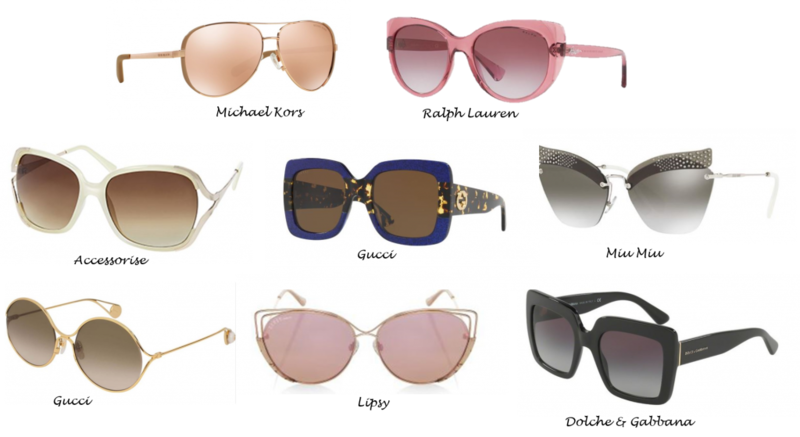 If you are more classic in your style personality then choose styles that have longevity, that you can wear time and again, like the Michael Kors Aviators perhaps, or Wayfarer or Jackie O style. If you love to add a bit of drama to your look then why not have fun with some coloured or eye-catching sunglasses like the Gucci blue and leopard print style or the Mui Mui ones below. Choose frames to suit your face shape – in general the rule is that ‘opposites attract’, so if you have a rounder face then the more angular styles will be perfect for you (like the square D&G ones pictured), and conversely if you have a more angular face (e.g. square or rectangular) then the more rounded styles (like the gold Gucci ones below) will be more flattering. Cat-eye styles can look lovely on you if you have a square face shape as it makes the upper half of your face look broader and hence gives the illusion of a narrower bottom half. If you have a heart shape/inverted triangle face shape (proportionally broader at your forehead) then avoid the cats eye/winged up styles and instead choose a rimless frame or something with bottom heavy detail, and if you are broader at your jawline (triangle face shape) do the opposite to bring the eye upwards. Think about the width of the arms. Broader arms are great for breaking up a longer face but will make a shorter face look even shorter. Choose the frame colour to suit your colouring type. If you’re a ‘Light’ or ‘Soft’ for instance then be careful not to choose the darkest frames and lenses as they may look too heavy. You will look lovely in the lighter shades from Accessorise, for example, if you have ‘Light’ colouring. If you have Deeper colouring then something as dark as the D&G shades will work well. If you are a Warm in terms of your colouring type then look for warm golds (like the Gucci and Michael Kors styles), browns, or tortoiseshell colours. These will not look nearly as nice on Cools who instead look stunning in silvers, greys, or for fun, pinks (like the Ralph Lauren ones) and purples perhaps! If you’re a ‘Clear’ then why not have some fun with some bright frames like the blue and leopard print Gucci ones! Softer colouring types suit mid-tone shades so simply avoid the bold and very dark colours. (If you’re unsure of your colouring type come and enjoy a colour consultation and take the guess work out of the equation!). Choose the lens colour to suit your skin tone – warmer skin tones suit the browner lens hues, whereas the grey/black tints will better suit cooler skin tones. Think about your scale, height and the size of your head. If you have a small head, and/or are petite and/or fine boned, for example, you need to take care not to choose sunglasses that are too big as they will overwhelm you. The bridge of the nose is also a consideration. If you have a longer nose then a lower bridge will be more flattering and conversely, if you have a shorter nose a higher bridge will suit you best. If you’d like some help just get in touch. I know it can be so tricky choosing glasses, whether they’re your everyday glasses or sunglasses. It can also be a costly exercise, and if they are your everyday glasses they will be something that you put on every day, so you’ll want to get it right. I am often asked to take clients shopping for glasses, to give that objective and honest second opinion, so I’d love to help you. In the meantime, enjoy the sun and looking stylish in your sunglasses!